Those of you who have activated your iPhone through an unauthorized carrier (aka hacktivation) on iPhone 3.x, then your Push Notification functionality in most cases will be broken. Even if you have tried getting it to work through “PushFix” via iPhoneil available in Cydia, it wont work as that fix uses a single shared certificate for all users who have installed it. This causes battery drainage and huge use of cellular data access. But now with PushFix 2.0 from PushFix.info, you can get a unique certificate key which is only intended for your hacktivated iPhone. Each unique certificate costs US $5.99. From all the testing I have done with it on one of my hacktivated iPhone 3GS, I can assure you that this thing really works as advertised. If you want Push Notifications on your unlocked iPhone, go for Pushfix 2.0. It is really worth it! If you have had the old Cydia Pushfix installed, I’ll suggest you to start from scratch by restoring your iPhone to iPhone 3.1.2 firmware. Step 1: Once you are done with the purchase bit, simply install “Pushfix 2.0” package from Cydia via http://cydia.pushfix.info repo. Install the package only if you have purchased the certificate or else the installation of Pushfix 2.0 will fail cause it checks your IMEI on its server before installing the package. 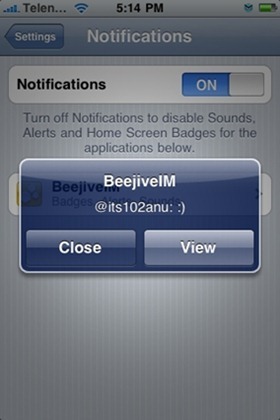 Step 2: Now simple install any Push capable app from App Store like IM+, Beejive IM, Ping! or Boxcar and Push should be working on them right away! A video review of the app will be up soon. We’ll also be giving away 5 free keys of Pushfix 2.0 to our readers here at Redmond Pie. Details on it will be posted shortly. Stay tuned! Feel free to ask me any question should you run into any problem getting Pushfix 2.0 to work on your hacktivated iPhone. You can also get in touch with the developer of the app who is extremely helpful and he has setup a dedicated forum for it where you can ask for support. UPDATE 1: PushFix 2.0 free giveaway is up. More details here. man cant wait for it………… its gonna solve lot of d problm with my network coverage i guess ……. Charging for a fix? Wtf? Awesome. I just gave my 2 daughters unlocked Jailbroked iPhone 2g's and we were trying things like words with friends, TextNow SMS, iSip and they were not getting the alerts over wifi. Found redmond pie with this great story, installed on both phones problem solved! I was happy to pay $12 for a quick fix for the long term savings I'll have from unlocked phones using a prepaid phone plan. glad you got it to work. This fix is just so awesome! Cant believe I used my 3GS for this long without a workable fix for Push Notifications. je n'y croyait plus, j'ai enfin retrouvé mon push moyennant 4 euros et des poussieres. Genial!!! Is there any way the push servers can recognize these certs and stop accepting them? I'm not familiar with the way Apple implemented the push technology, so I don't know if it is a potential problem or not. Anyone have any idea? 1) I answer all your questions within minutes to a few hours, not through some broken email support system, but through a real-time ticket system that sends push notifications right to my phone when a user needs support. 2) This fixes push for the life of your phone. The app will reinstall your certificate in future firmwares or restores. 3) This supports me to develop free fixes for other problems, which I have already been releasing. I have also donated money to open source projects, such as ProSwitcher and will continue to donate in the future. See : http://pledgie.com/campaigns/7410 for @pushfix as an example. 4) I provide free help on my forums for even non-customers with push problems that are on official carriers. Who else sells a product and does that? You can either struggle for hours trying to get it to work for free or you can pay and have it done in 5 minutes because of all my work on it. I leave that up to the users. Many struggle and then come to me and I wish I could save them the struggle. Exactly. Thank you for realizing the savings and also understanding that this is a one time fee that fixes push for the life of your phone. Your certificate is always re-applied when you install Pushfix 2.0 in current or future firmware. The certificates have a serial number, but through analysis it is random. There is no identifying information in the certificate. You could generate a very similar certificate using OpenSSL, except that Apple only accepts certificates signed by Apple's certificate authority. All they really consist of is unique encryption keys (1024 bit) and the serial number of the certificate is how they identify you in the push notification system. See my site and forums for even more information on the topic. The Pushfix 2.0 package available there is a paid solution because it does work and includes full tech support. Great fix!!! Totally worth the 6 bucks…to all the complainers who want everything free go get another phone…support was very responsive! Thanks dude!! Does it also fix the wi-fi speed problems? Everyone, Geohot is working on this right now and is beta testing a blacksn0w update. The WiFi problem comes about when using blacksn0w (or sometimes even on official firmware) and has nothing to do with Pushfix 2.0. I paid & downloaded it, but my push notifications are still not working. ex. IM+ push. i have recently lost my wifi connection. upgraded to 3.1.2 before xmas, was perfect for a month, then just disappeared. sometimes i get ‘cannot scan’ and sometimes i can join my network but only for a few seconds. to install PushFix, must I restore my iPhone first? Ye and what about the folks who pay the 6 bucks only for it not to work…Will they be refunded?? I think not. Great fix! The best 6 dollars I've spend so far! Thanks a lot! If any people folks has trouble ՍΝᏞΟᏟΚing AT&T phones, because you am not aware of any good third party սոⅼοсking method, you can have a hunt at just google atttiphoneeuunloockiing, it’s the fastest site for ՍΝᏞΟᏟΚing, we have the flexibility to ՍΝᏞΟᏟΚing the new 6S and 6C as well.